Having a Jedi character in the party can be a great asset to any group of adventurers. In combat especially, the amazing skill with which one can wield a lightsaber. However, source material thus far on the physical traits of a newly constructed lightsaber are oddly missing. This page has the Official West End Games material for lightsaber construction, as well as some material created especially for the Star Wars RPG Database concerning many of the lightsaber details overlooked in official material. Of course, as West End says, none of this is the be all and end all of lightsaber details, just some suggestions that seemed to make sense. Feel free to tinker with this material, and most of all, enjoy it. "Jedi apprentices spend a great deal of time and effort constructing lightsabers, an elegant wepon of ancient technologies. The blade helps the Jedi focus, attuning him to the Force so that it more easily flows through him. It is used for combat only when other methods of conflict resolution have ended in failure. Most Jedi build several lightsabers over a lifetime, each saber more powerful and well-balanced than the last. These improvements relect the Jedi's increasing prowess in his use and understanding of the Force. The loss of a lightsaber can so demoralize a Jedi that he momentarily stumbles in his ability to access the Force (losing 1D (D6)/-2 (D20) in Force skills until he constructs a new blade. A lightsaber must have the following parts: a power cell, a handgrip, an activation plate, a safety, a belt ring (optional), a blade length adjuster (optional), an emitter matrix, a recharge socket, a lens assembly, a focusing crystal, and a power conduit. Most handgrips have a length of 24 to 30 centimeters, with the blades extending themselves up to 1.5 meters. To construct a lightsaber from its components parts takes a minimum of one month and requires a successful lightsaber repair roll against a Very Difficult difficulty (D6), or a Craft (lightsaber) check (D20) as per the rules on page 153 of the Core Rulebook. Decrease the difficulty level by one difficulty level for each extra month spent building the saber, to a minimum of Easy (D6), or decrease the DC as per the rules in the Core Rulebook (D20). Jedi characters may adjust the lightsabers base damage die code through modifications [the same way as modifying damage die codes for any other weapon]. Characters rely on their lightsaber repair skill to make such improvements." The process of creating a lightsaber varies depending on who the craftsman is, with each artisan giving the saber his or her own personal style. Most Jedi use Adegan crystals, found very rarely but usually nearly flawless. Taking these naturally-ocurring crystals, they build the lightsaber to their own personal tastes, in perfect harmony with nature through the crystal. The Sith, however, use a special furnace to artificially craft crystals in an intense heat, using the Dark Side of the Force to shape the crystals' growth so that when it is time to remove it from the furnace it is already shaped to perfectly suit the Sith Lord's needs. Obi-Wan Kenobi's journal, which was what taught Luke how to construct his own saber, used a method simlar to the Sith's artificial crystal method. Regardless of whether or not natural crystals or synthetic crystals are used, the process of creating a lightsaber is one of the most essential lessons the Jedi (and Sith) teach their students. 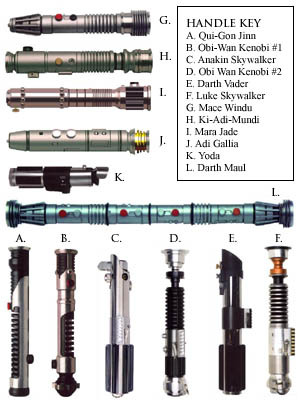 The handle of a lightsaber varies widely, depending on the maker. In "I, Jedi" by Michael Stackpole, Corran Horn constructs a lightsaber from the handlebar on an old swoop. The Jedi of the Old Republic, however, constructed much more aesthetically pleasing, and complex, saber handles. Here are examples of how lightsaber handles can vary. While it may seem to be a bit of trivial detail, the color of a lightsaber is as much a part of the personality of the weapon as anything else. Upon completion of the lightsaber, roll 1d6 and compare it to the Standard Lightsaber colors table. Should a 6 be rolled, reroll and compare it to the Rare lightsaber colors table. A lightsaber can be anywhere from 1.0 to 1.5 meters in length. Like rolling for color, roll 1D on the table below for the length. A Note On Adjustable Lengths: A character may choose to modify lightsaber so that the length can be changed by turning a dial on the handle of the lightsaber. For each length aside from the standard length, make a lightsaber repair roll against a Moderate difficulty, modified one more difficulty level for each extra length (D6), or made a modification to the DC of the final Craft check (D20). Example: A Jedi decides that he wants a lightsaber with three lengths in total. His standard length blade requires no extra roll or DC increase. However, for the second length, he must roll a Difficult lightsaber repair roll (Moderate + 1 difficulty level) (D6), or add +5 to his Craft DC (D20). For the third length, he must roll a Very Difficult lightsaber repair roll (Moderate + 2 difficulty) (D6), or add +10 to his Craft DC (D20). Should the Jedi fail any one of these rolls, the lightsaber will not function. If all three are passed, the Jedi rolls on the below table for a standard length, then chooses additional lengths (from .5 m to 2 m). The following miscellaneous modifications may be made to a lightsaber. In order for the Jedi to join two lightsabers together, he must find the following items: a set of special welding tools (50 credits), a magna-lock for each saber (200 credits each), a release switch (50 credits), and a power connector (150 credits). Once obtaining these items, a Jedi may attempt, with a Very Difficult lightsaber repair roll (D6) or a Craft (lightsaber) check DC 20 (D20), join the two together. Failure to make this roll results in one or both of the sabers being damaged, depending on how badly the roll was missed by. If the roll is a success, they are joined by a powerful elecromagnetic field which can only be unlocked by hitting the release switch. They are joined together at the base of each saber and make a staff-like weapon. This device is used to modify a lightsaber such that it will not function for anyone except certain people. A small sensor array (800 credits) and recognition chip (350 credits) are installed in the handle of the lightsaber, which reads the cell patterns of whoever is holding the weapon. If the cell patterns do not match that of designated "safe" users, the weapon's power cells shut down, and any failsafe devices are activated. Failsafe devices can range from electrocution to a loud warble to a quiet beacon which alerts the owner via comlink that the weapon is in the hands of an unauthoried bearer. A Difficult lightsaber repair roll (D6) or a modification to the Craft (lightsaber) check of +10 is needed to install this device. This adapter for the handle of a lightsaber allows for what is, in essence, a "deadman" switch on a lightsaber. The lightsaber activates and deactivates as normal, but automatically deactivates should the pressure on the handle of the lightsaber be removed. This is also a good when combined with the lock-on switch mentioned above. This pressure sensor itself runs roughly 600 credits. The call beacon is the simplest device to install in a lightsaber. This device will summon a ship with a slave circuit like a regular call beacon, only the button is embedded in the handle of the lightsaber. This requires a Moderate lightsaber repair roll (D6) or a modification of the Craft (lightsaber) check of +5 (D20) to make the modifications. The cost for the call beacon to attach to the lightsaber is roughly 1,000 credits. A Jedi may choose to create a hidden compartment in his lightsaber which can only be accessed if you know what to look for. The cost is no more than the cost of the supplies to construct the handle of the lightsaber, however the difficulty when crafting the blade is increased by one difficulty level (D6)/+5 to DC (D20). When constructing a lightsaber, some Jedi (particularly those at home in a moist environment, like Mon Calamari) add a secondary water-proof casing to the handles of their lightsabers in order to protect the power cell inside. While still not reliable for functioning underwater, this will allow a lightsaber to be carried normally on aquatic journeys, without the necessity of removing the power pack. A water-proof casing costs roughly 200 credits, and must be crafted at the same time as the lightsaber itself to fit properly over the handle. A notable Jedi from days long gone made a particularly odd modification to his lightsaber that some consulars might find useful. From the early stages of planning, he designed his lightsaber to contain a small droid translator unit, as well as a form of vocabulator with a built-in earpiece for discreet use. This enabled the Jedi to have a translator with him wherever he went, right there in his lightsaber which never left his side, for use in delicate situations requiring precise translation. The cost of installing this is roughly 800 for the droid parts, plus another 300 for the necessary wiring and pieces of the lightsaber. It is possible for some of the most skilled lightsaber craftsment to design a lightsaber that does little more than stun an opponent, rather than slicing them as a standard blade does. These blades use a very special kind of crystal that alters the harmonics of the lightsaber blade such that it no longer deals normal damage. Instead, the lightsaber does stun damage equal to the standard damage rating of the weapon, but no longer ignores the hardness of items. The cost of this is 5,000 credits minimum for the crystal, plus the difficulty for creating the blade is increased by two difficulty levels (D6)/+10 to the DC (D20). This special crystal can also be used in place of a blade-lengthening one, effectively creating a lightsaber which can be switched from normal damage to the stun setting; use the rules for a variable length blade in addition to the stun damage blade when determining the difficulty of construction. Some Jedi design their lightsabers to have secondary functions, such as a glowrod, a comlink, or a syntherope dispenser. In such a case, the cost of making the modification is merely the cost of the secondary function, and the difficulty to install is increased by one difficulty level (D6)/+5 to DC (D20). Typically reserved for Dark Jedi, some lightsabers have special traps in their handles to prevent unauthorized use. The handle may have spikes or blade which burst forth from the handle and damage the user (2d4 damage), or electrocute the user instead (1d6 shock damage). Whatever the trap, they are triggered typically through incorrect cell recognition (see the Cell Recognizer above), or by a "dummy" activiation switch which triggers the trap. The difficulty to install a trap is increased by two difficulty levels (D6)/+10 to DC (D20), and the cost varies from 300-1000 for the parts. Some Jedi texts from the days of the wars with the Sith indicate that certain Sith warriors had perfected the art of effectively silencing a lightsaber blade. By adjusting the crystals within the blade, and adding a few special ones to reduce noise, some lightsabers have been reduced to a nearly noiseless blade, making only the faintest whisper of a noise when activated. The cost of obtaining a silencing crystal is 2000 credits (or more; they are exceedingly rare), and the difficulty to install is increased by three difficulty levels (D6)/+15 to DC (D20). Lightsabers can (and often are) used as the focus of adventures, and are means of telling a better and more fluid story in a roleplaying game. Of course, it is easy to use the creation of a lightsaber by a PC as a means for furthering the plot of a campaign. The character must find the necessary parts, purchase crystals, and collect all that's needed before he can even begin assembling. However, GM's aren't limited to this tried-and-true method of furthering the plot; there are many ways in which a lightsaber can serve as the focus of the story. Perhaps the weapon also houses a Jedi holocron, which is instructing the masterless Jedi in the Rebellion era while the campaign goes along. Conversely, perhaps it is a Sith holocron which is attempting to seduce the fledgling Jedi to the Dark Side of the Force. The weapon's value is also considerably greater once it is discovered to be housing a holocron; bounty hunters, thieves, Dark Jedi, and other groups will be hot on the party's heels in an attempt to obtain the weapon. Instead of a holocron, perhaps it has a holographic map imbedded in its hilt, leading the party to a mysterious planet to explore ancient Jedi/Sith/Krath/etc. ruins, leading them further and further into danger. Or perhaps the weapon houses an electronic key, which will open the entrance to a secret vault somewhere, again putting the party right in the line of fire as the greedy and the deadly pursue the lightsaber with reckless abandon. The Force power Inhabit Object could be used to create quite plot device. As Exar Kun and Callista Ming did, perhaps a Jedi or Sith placed his spirit into his lightsaber for preservation upon his death, and now it has fallen into the hands of the party members. Perhaps it offers the characters gentle nudges and warnings through the Force; or, in the dark of the night, the character awakens from terrible nightmares, slowly driving him over the edge towards the Dark Side. At a critical moment, the lightsaber refuses to activate unless the spirit's wishes are heeded, or perhaps the blade randomly ignites at an inopportune time, refusing to shut off. Perhaps the spirit lends some of its energy to the Force ability of the bearer (giving a bonus to Force power rolls), or draws part of the bearer's life essence into itself over time (giving a penalty). Maybe the lightsaber has some legendary history behind it, or is a relic of some famous historical event. The lightsaber once belonged to Darth Vader himself, or Cay Quel-Droma, or any one of the other famous Force users. Perhaps it was discovered on the battleground at Ruusan, or was used to slaughter Jedi during the Purge after the Empire rose. The lightsaber might be part of a matched set which once belonged to a Battlemaster, and its twin has fallen into the hands of the part's enemy. Regardless of what the Gamemaster chooses to do, there are many variants of these themes that could be implemented with ease into any campaign to give it action, mystery, adventure, personal ties, and great character development.